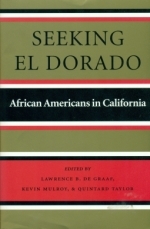 SEEKING EL DORADO: African Americans in California, 1769-1997 | Dr. Quintard Taylor, Jr.
From the 18th century, African Americans, like many others, have migrated to California to seek fortunes or, often, the more modest goals of being able to find work, own a home, and raise a family relatively free of discrimination. Not only their search but also its outcome is covered in Seeking El Dorado. Whether they settled in major cities or smaller towns, African Americans created institutions and organizations--churches, social clubs, literary societies, fraternal orders, civil rights organizations--that embodied the legacy of their past and the values they shared. Blacks came in search of the same jobs as other Americans, but the search often proved frustrating. Throughout the 19th and 20th centuries, African American leadership in the state consistently focused on achieving racial justice. The essays in this book speak of triumph and hardship, success, discrimination, and disappointment. Seeking El Dorado is a major contribution to black history and the history of the American West and will be of interest to both scholars and general readers. Kevin Mulroy is the associate university librarian for academic services at the University of California, Los Angeles (UCLA) and the author of Freedom on the Border: The Seminole Maroons in Florida, the Indian Territory, Coahuila, and Texas and Seminole Maroons in Indian Territory, From Removal to Oklahoma Statehood, 1837-1907. Lawrence B. de Graaf is Professor Emeritus at California State University Fullerton and the author of numerous articles on African American history in California. Quintard Taylor is the Scott and Dorothy Bullitt Professor of History at the University of Washington; his publications include The Forging of a Black Community: Seattle's Central District from 1870 through the Civil Rights Era, In Search of the Racial Frontier: African Americans in the American West, 1528-1990 and African American Women Confront the West, 1600-2000. Other contributors include Elizabeth Fortson Arroyo, Albert S. Broussard, Lonnie G. Bunch III, Willi Coleman, Bette Yarbrough Cox, Douglas Flamming, Jack D. Forbes, Gerald Horne, Gretchen Lemke-Santangelo, Kevin Allen Leonard, Delores Nason McBroome, Shirley Ann Wilson Moore, and Raphael J. Sonenshein. Taylor is the website director of the award-winning portal www.BlackPast.org Dr. Taylor spearheads this 3,000 page website which is the largest free and ungated reference center on African American history on the Internet. BlackPast.org is dedicated to providing reference materials to the general public on African American history in the United States and on the history of people of African ancestry around the world.